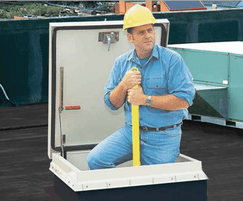 The LadderUp® safety post extends the available hand holds on a fixed ladder, making it safer to exit or enter a roof hatch, floor door or manhole. A permanently mounted but retractable telescoping vertical post, LadderUp® extends easily in a one handed action to provide an additional hand hold at the egress of the roof or floor opening. 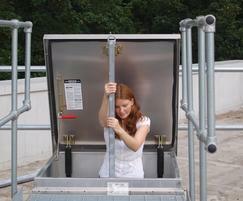 This maintains the three essential points of contact with the ladder as recommended by the Health & Safety Executive. A spring loaded mechanism helps the user to raise the post effortlessly into place, where it automatically locks into place to provide a firm hand hold to aid the user’s upward progress. After use, LadderUp® is equally easy to retract by means of a simple release lever which allows it to be lowered back into place with one hand, maintaining the third point of contact. 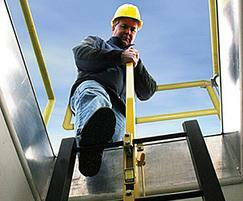 LadderUp® can be retrofitted easily to any existing fixed ladder of suitable construction. The post is installed on the top two rungs of a fixed metal ladder, below the hatch cover. It adapts to fit almost any configuration and spacing of the rungs. To ensure long, dependable service, the LadderUp® safety post is available in four levels of corrosion resistance to withstand standard to harsh environments, depending on the application. 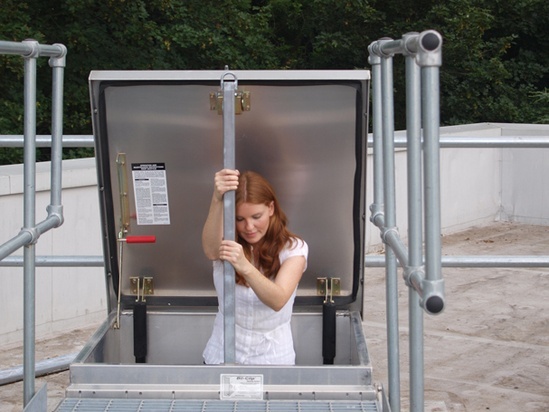 The third point of contact provided by the LadderUp® post ensures added balance and security for the user when passing through the hatch opening. Bilco’s patented LadderUp® safety post, which extends the available hand holds on a fixed ladder, is fast becoming one of the construction industry’s most widely adopted safety measures, particularly as a retrofit product.